What are sods, anyway? MOUSES! Odds and sods... Apparently, they're bits and pieces. Interestin'... You know, I find it very odd that the sods in odds and sods has nothin' to do with sod. Again I must say, MOUSES! But that's enough about that. Let's get down to business here and start discussin' my odds and my sods. Okay? Okay. So glad we have that sorted. Now to start sortin' my bits and my pieces. MOUSES! In the past week or two, I managed to score two awards. 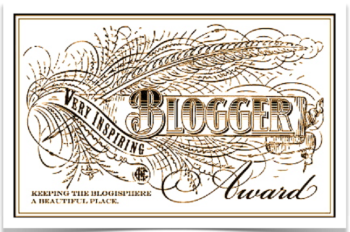 The first was, I am told, for very inspiring bloggers. 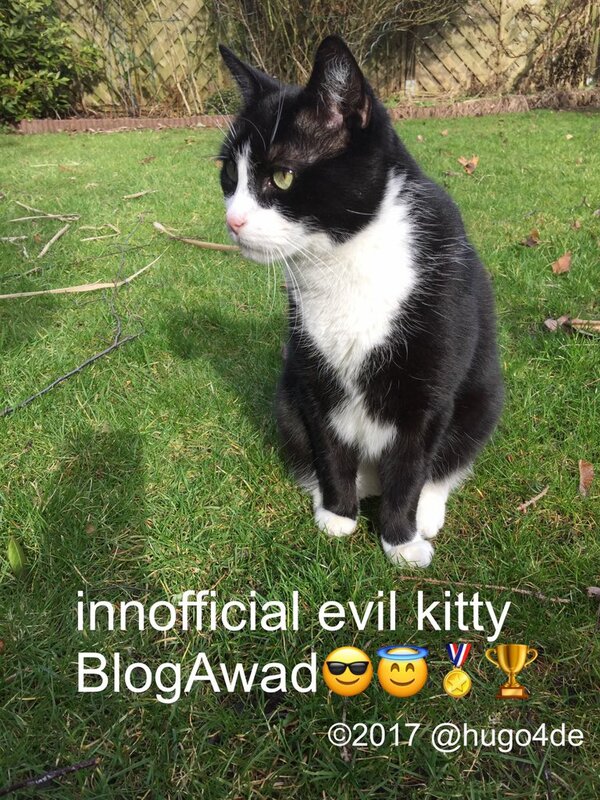 My dear friend Basil, from Basil the Bionic Cat's Blog, honoured me with the lovely Very Inspiring Blogger Award and then, my wonderful pals over at the 15 and Meowing blog did so, too. Yoo-hoo! YOO-HOO! Truth be told, I've already received this lovely award but I decided that since I really love awards, I would accept it once more. I'm supposed to list three things that inspire me. Well that's pretty easy. Firstly, my peeps inspire me. Or rather, they provide inspiration for many a blog post. Perhaps inspiration isn't the most appropriate word. Fodder? Yeah, fodder. They provide fodder for many a blog post. Especially Peep #1. She's always up to mischief about which I can blog. MOUSES! Secondly, the news and in particular, news comin' out of Ottawa. Hmmm... That one probably falls into the fodder category, too. Once more I must say, MOUSES! Thirdly, I am inspired by the garden and the great outdoors and Mother Nature, herself. Birds singin' and flowers blooming are inspiring for both body and soul. Nothin' else like 'em, at all. Very inspiring, for sure. Award number one down and onto number two. 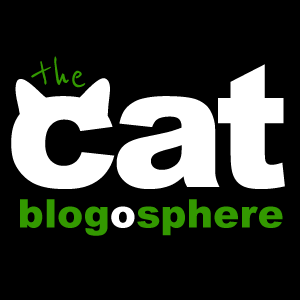 My friends over at the 15 and Meowing blog gave me the Creative Blogger Award as well. And then, just the other day, my pal Simba from Simba's Antics gave it to me, too. Yoo-hoo! YOO-HOO! This award is also one I have received before but, like I said earlier, I LOVE AWARDS! How could I resist not acceptin' it again? Well for starters, I'm a mancat. I know that most of you probably already know this but Ol' Peepers here went and gave me a girls' name and in doin' so, created a lot of confusion. Just thought I'd mention it again. Secondly, I've been published! In print and everythin'. 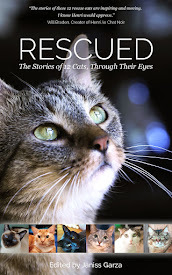 That's right, in case you hadn't heard, my rescue story is in the book, Rescued: The Stories of 12 Cats, Through Their Eyes. I wrote it myself. My personal rescue story, I mean. It's the story of my first few formative months. Number three... Let's see... I have been diagnosed with the medical condition Exocrine Pancreatic Insufficiency. More on that in just a bit. Fourthly, I've been gettin' out in the garden in the last week or so. This is kinda big news on account of the rotten winter we've had that simply refuses to leave. There's still some snow on the ground but it is goin' and things are comin' to life in the garden. I'm hopin' to get out more and more with each passing day. And finally, I'm vyin' for a Senate position. Yeah, you've probably heard 'bout that, too, but just in case you haven't, I'll mention it again. What I need is for the Prime Minister of Canada to appoint me to the Senate. That's all. Don't need to run in an election or anythin'. Senators aren't elected here. They're appointed. One little appointment is all I need. 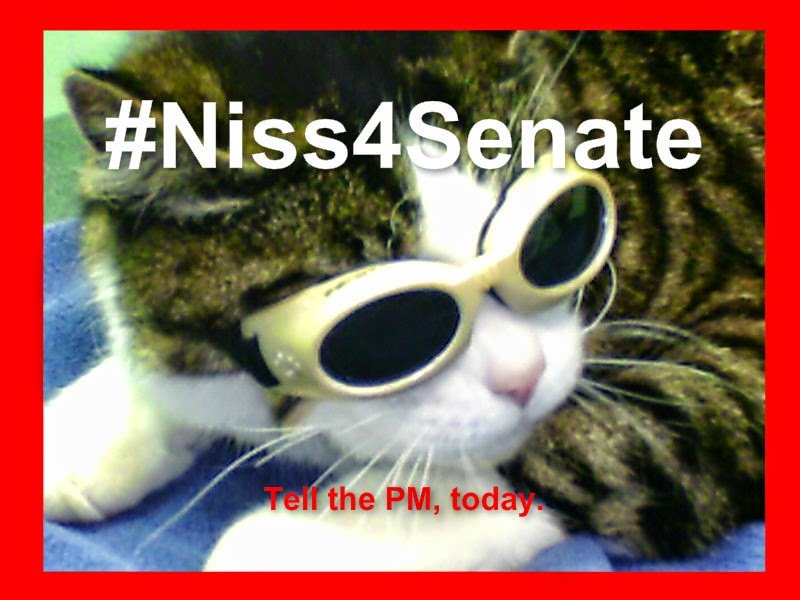 #Niss4Senate - Tell the PM, today! 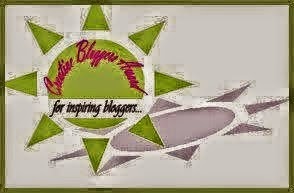 For both of the above awards, I'm supposed to thank the bloggers who gave 'em to me so... THANK YOU!!! 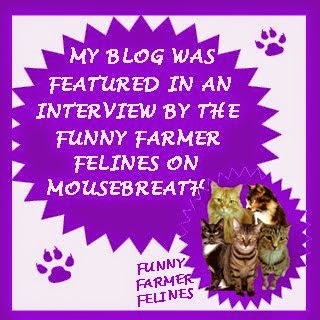 Please feel free to visit their blogs. They all have great blogs, for sure. 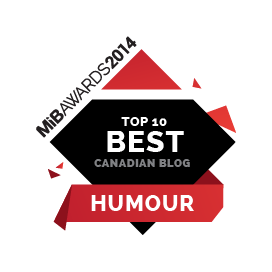 Just click on their blogs' names and you'll be magically transported right over to 'em. Easy peasy, I do believe. And I'm also supposed to pass the awards along but I think everyone already has 'em. But if not, and if you'd like one, please grab either or both and know that you're doin' so with my blessing. I would also like to thank my pals over at 15 and Meowing for the lovely get-well prezzie they sent. You should see the toys! Their mum made 'em with yarn and stuffed 'em with nip and boy-oh-boy, they really are great. I love 'em! We all do. Yes, I'm sharin', for sure. The peep was gonna take a picture of me with that lovely get-well gift but truth be told, I'm not lookin' my best right now so we decided to hold off on any picture takin'. I wanna look my best for the camera. And that brings me to a medical update. Like I said, I have Exocrine Pancreatic Insufficiency. Basically, my body is no longer producin' the enzymes necessary to digest food so even though I'm eating, it's hard to get proper nutrition. That resulted in my losin' a lot of weight. Way too much weight, for sure. Things were pretty touch and go for a while. The only meds I could get up here in Canada were in powder form and they HAD to go into my food. It was so gross. The meds were partially digesting the food before I ate it. I was literally eatin' partially digested food! MOUSES! Actually, that's not quite true on account of the fact that I was refusing to eat. Did I mention that the food with my meds was gross? So the peep did some research and found that in other countries, my medicine is available in tablet form but she couldn't get it here in Canada. But then we found an American company willin' to work with my doctor to get a special import permit and things were lookin' up. But in the meantime, my doctor found a source for my meds right here in Canada! And they're tablets and everythin'!!! They're not actually meant for cats. They're people meds. Yup, I'm takin' peep meds and taking 'em like the real trooper, I am. So the Peep says that I appear to be holdin' my own. I've only thrown up a couple of times since startin' the tablets and my poops are much firmer. I have a weigh-in tomorrow and have my paws crossed that I'll have gained an ounce or two. If so, I'm on the path to recovery, for sure. And now for the big news. The big news for which you've all been waiting. The winners from our adventure! In case you missed it, my pals and I went on an adventure to promote the book, Rescued: The Stories of 12 Cats, Through Their Eyes. It all started when Savvy of Savannah's Paw Tracks invented a new form of paper containing the nip. The story continued on the DashKitten blog with Silver teleporting over to FitCat Publishing to hack into their computers so that we could secretly substitute Savvy's new paper for the plain ol' paper they had previously been using. 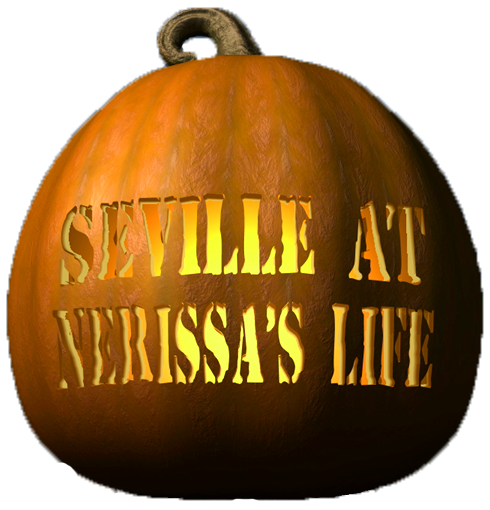 And finally, we concluded our story right here on Nerissa's Life when I managed to score a roll of that special nip paper for myself! Okay, okay... I know... You're all dyin' to know who won books. Savvy's mum put all the entries - and there sure were a lot of 'em - into that ol' Random dot com thingy and three names were selected. And the winners are... Drum roll, please. Winner number one is... Toby & Leia from The Whiskeratti! Winner number two is... Sammy from onespoiledcat! Winner number three is... 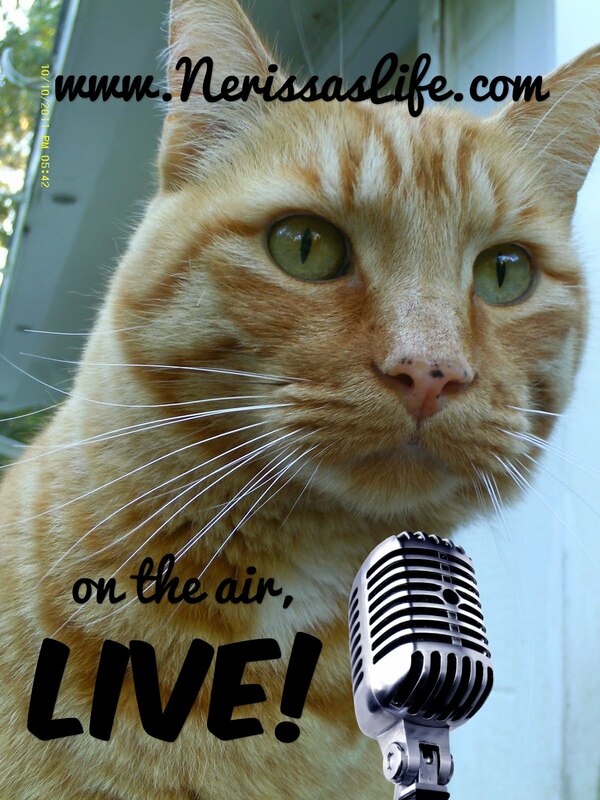 The J-Cats from Purr-sonally Speaking! CONGRATULATIONS!!! We'll be in touch with each of you shortly for contact information so that we can send you your copy of Rescued: The Stories of 12 Cats, Through Their Eyes. 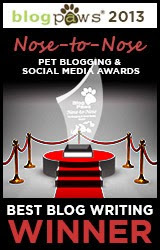 Congratulations to the winners...We at Mischief & Mayhem Central are pleased to see this book being sold and distributed to benefit Angellicle Cats Rescue. Well, Onward... Nissy, we're pleased the peeps; pills for pancreatic pawcity seems to be doing the trick. Get better old buddy. 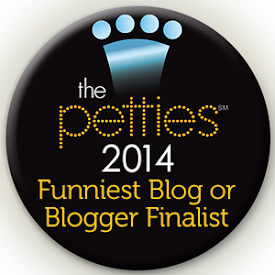 You're one of our favourite bloggers and you tie for first place as our number 1 fan/promoter/sharer. You, our dear ol' pal keep us in stitches... yes you do, for sure. Congrats for all those awards! And congrats to all the book winners! Glad your pills are helpin - we's sendin ya big purrs from down in Texas. Concatulations on the awards - and concatulations to the RESCUED winners! Tell them that when they read the book, my human would muchly appreciate a review on Amazon. Right now, there are still more authors than there are reviews! On the medical front, that is awesome that the vet found some people meds that are working for you! Whatever works, right? Paws crossed you put back on some of that lost weight. Congrats to the winners and on your rewards. Good that the vet found a people pill for you, but don't go turning human on us. Concatulations to the winners. But the best part of all of this email is hearing that you are feeling better, even if it means you have to take human medicine to do it. Well now...furstly Concats to da winners and second, Concats to you. Furdly, odds and sods huh? We call it odds and ends here in da souff. 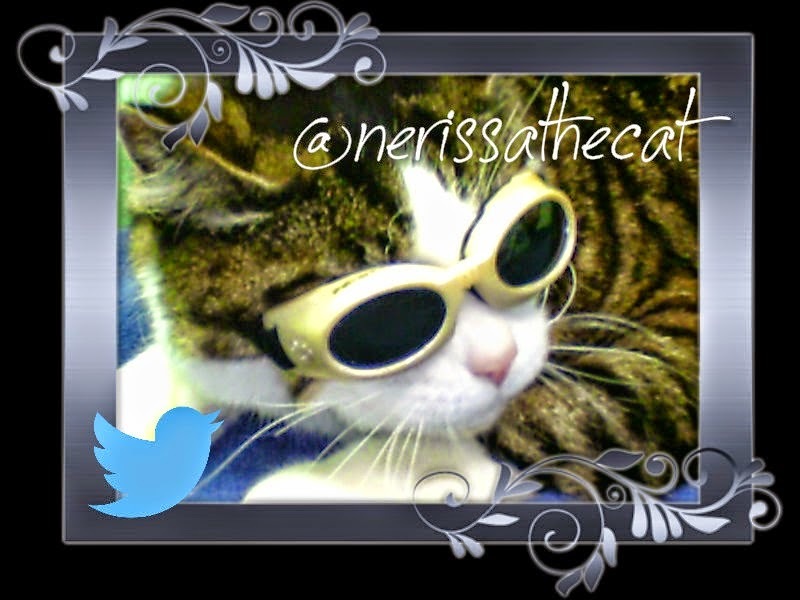 MOL But most purrtantly weez glad yous got yous medicine and and awe takin' it well and gettin' all better. 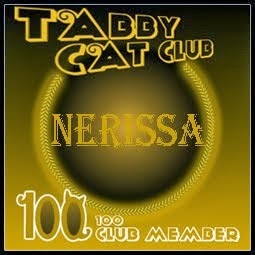 Now, yous lissen up Nissy, No matter what yous look like yous be a vewy handsum mancat. You hear? We luv what's on da inside of ya' and dat's what we see on da outside too. You know sis Lexi lost ovew half hers body weight when she got sick wiff dat kidney disease but we fink she's still just gawjus. She's havin' twubble gainin' it back too, but she'll always be bootyful to us. Da same as yous'll always be handsum. So yous just send anypawdy hoo sez udderwise ovew to us and weez'll take cawe of 'em. Hope yous have a gweat week and weez'll be purrayin' fur ya'. Congrats to the winners of such a great book. Thanks for the shout outs Nissy and for accepting the award again. You deserve every award out there. I am happy to hear that your peep worked so hard to get you some meds you can tolerate. I pray for you daily. I look forward to seeing a photo of you playing with the nip toys when you are feeling better. PS: I admit I thought you were a girl too when I first started reading your blog- sorry. Same thing happens to our boy, Millie. Congrats on the award, congrats on getting the meds you need & congrats to the winners of your books!!! Congratulations on those awards, Nissy! And to the book winners, too! We are so, so happy that your vet and the peeps found those pills, and that they are working for you. 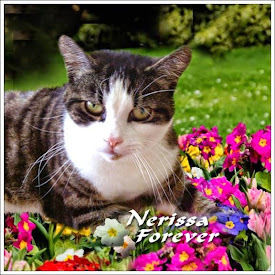 Hey Nerissa, great blog, great awards and the Cats and I here at the ARC are enjoying the book immensely. 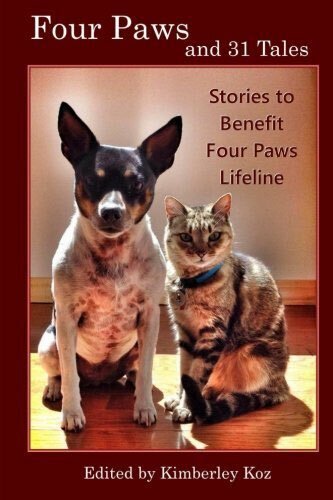 The cats give you and the other writing Cats a Paws Up on the book. Hmm as far as the name goes, I wouldn't consider it a girls name. My grand daughter's name is Narissa, that is how you spell it for a girl. So no fear, you are a man cat all the way. Glad to hear the pills are working, we all have paws crossed for your weigh in that it is up. 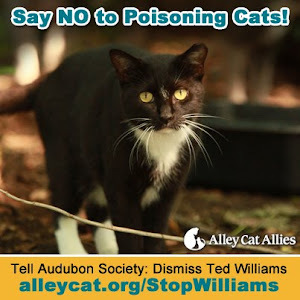 Take care, hugs and Purrs from all of us at The ARC. Oh yes and congrats to the three winners of the book Rescued, hope you enjoy it as much as we have. Congrats on the awards pal and congrats to the winners! Hey, I am so glad to hear you are holding your own. I hate it when someone else holds mine. Seriously, we are so happy for found those meds, purrs, purrs and more purrs to you from all of us. This is our Second Attempt to post a comment this morning, but We aren't sure if the previous one got through. If it did, you can disregard this one. Furrst - and most impawtant of all - we are all furry, furry glad your Human has managed to find a way to get those tablets for you. We hope they will do the trick and that you will soon be all better. We were effur so worried about you. Second - of course We support your campaign to be appointed to the Senate! We will drop a word in your PM's ear and let him know (though We are sure he knows already) what an Ornament you would be to that August Body and how well you would fill such a Post). Third - concats on your two awards. They are well-deserved. Last - but not least (mol) - We are Absolutely Delighted to be among the Winners of that extremely impawtant Book "Rescued: The Stories of 12 Cats, Through Their Eyes" and we are looking forward to receiving it. We will send you our contact details in a separate comment, as requested. Pee Ess: Will our copy be on the new nip paper? Speaking of Rescued, we just wanted to stop by to say our human finally finished reading her copy. She really enjoyed it and thought your story was especially well-written and enjoyable! Purrs from Deb and the Zee and Zoey Gang! Congratulations on your Awards, Nissy boy :D and also Congratulations to the winners of the book. How Lucky they are! Congrats on your deserved awards! And we are so glad you finally found your meds. Wishing you a blessed Sunday! Wow! Lots and lots of Concatulations going on here! Concatulations on your awards! Concatulations on being able to gets your meds so that yous can gets better and Concatulations on running for senate! Mes thinks yous would makes a terrific senator, especially after all that kefuffle with Mike Duffy! And Concatulations on finally getying some spring out there. Mes LOVED reading yours and Dash and Savvey's story for the Rescue Stories and mes must say, for someone who has not been feeling all that well, mes was totally impressed with your exploits and finally Nissy, mes sending yous lots of LOVE and Healing purrs! Mes wants yous to gets better! Glad you can find your medicine in tablets now. Socks took people meds for awhile when he was so sick. Hope you are feeling better soon Nissy. Healing purrs and love. 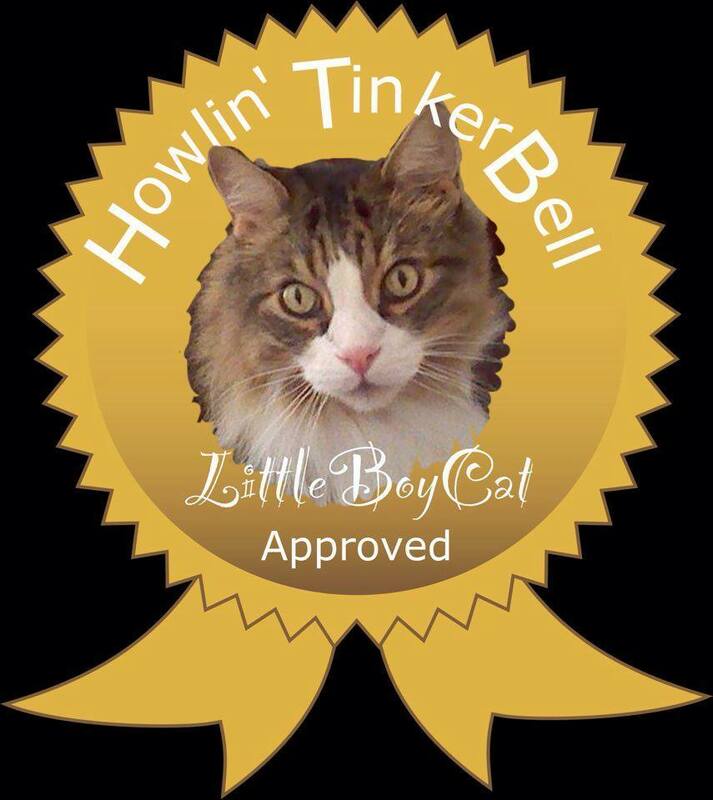 Hurrah fur thee winnerss!! It was a good contest wassn't it Nissy??? Pleeze take yur med(ss) an try to rest.